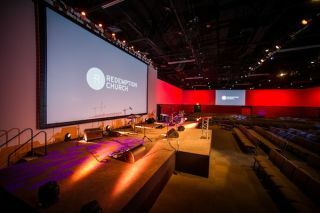 When Redemption Church recently committed to an expansion and retrofit of their multipurpose worship and conference center, they wanted an audio, video and lighting system that would provide a truly meaningful experience for each one of their members. The first challenge was the center itself, formed from an irregularly shaped room caused by a large extension designed to redefine the space without negatively impacting the original. Measuring about 180 feet wide by 60 feet deep, it was hardly ideal for reproducing sound, representing a very real challenge for any audio system. Fortunately, church member Jim Jorgensen was an experienced audio engineer who had a close relationship with Redemption Lead Pastor Tim Maughan. Because Jorgensen had worked for leading audio providers and Martin Audio as a product support specialist, he was a logical choice as a consultant for this project. When Maughan set out to find the ideal system for the new center, “Jim was the first person I called because he’d done the previous install in our chapel using Martin Audio W8LM line arrays. I didn’t want to do anything without knowing what he was thinking, because churches invariably have rooms with certain acoustic problems and typically there’s not a lot of work done to make them sound better. “I wanted the new worship center to sound as good as it could be,” Tim continued. “Jim’s first recommendation was the new Martin Audio MLA Compact system which he thought would be ideal for us because of its coverage and control. So we began to talk about it to confirm what I needed from the system. It had to do both music reproduction really well and the spoken word with absolute clarity. Most of the church systems do one or the other, but rarely do both. After a yearlong fundraising effort, Redemption purchased the MLA Compact system from On Stage Audio, a certified MLA installation partner. The actual audio setup consists of 12 MLA Compact enclosures hung in left, center, right hangs of four boxes each with two MLX subwoofers mounted under the platform stage at the outer corners. The system is completed by Martin Audio Merlin Controllers for loudspeaker and network management and also includes a Yamaha M7CL 48 channel mixer and a custom Whirlwind 64 channel splitter. Technical Director Tim Smith and rigger Mike “Milk” Arnold did the in-house installation. Much of the wall space is devoted to video with two 16-foot sections on the sides and a 28 ft. wide and 16 ft. tall screen behind the stage. The rest of the white walls are used for colored LED projections, all of which determined that the speakers had to be hung out of sight high up in the ceiling from flying frames attached to an angle iron hanging from trussing. Martin Audio Display prediction software was used to determine the optimum curvature of the arrays. “The system location actually grew out of a ‘wrestling match’ with video because everyone wanted the same space,” said Maughan, “so the challenge was finding the right location for the speakers. We’ve been fans of Martin Audio with the W8LMs and the F2s we use for a mobile outdoor system because they deliver exactly what we expect. This was a test of asking the MLA Compact system to do something for us, so putting it up in the ceiling and changing the points where it hits the audience and dialing that in worked perfectly. The sound is exactly where we need it to be, which wouldn’t happen with another cabinet. “I have huge expectations for audio,” Tim said. “Not just to reinforce sound, but to really make it musical. In most churches that I’ve been, none of the audio they’re running does that. It’s just sound reinforcement and often sounds really harsh without much quality. The MLA system has outperformed my expectations, which is rare. Maughan feels audio, video and lighting is a very subjective area in any church, especially Redemption, which is moving towards a more contemporary style of worship. Pleasing every member of the congregation, from the youngest to the oldest can be a delicate balance.